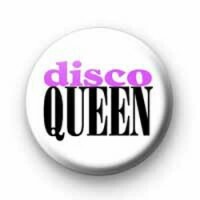 This fun slogan badge has the retro term Disco Queen written in a bold pink and black font. Are you a self-confessed disco queen. Why not let everyone know you're a queen that loves to dance and have a good time. If the music is playing you're 100% on the dancefloor. This is a fun badge for Hen Parties or LGBT/Gay parades. Be sure to check out our other music-themed badges, we have lots of designs to pick from.